As the Euros kick off tonight, where will you be watching? Will you be in a pub surrounded by friends? At work having to watch the game without your boss seeing? Or will you be watching from the comfort of your own home? Whether you love it or loathe it, football is a great excuse for a social gathering. If the sun is shining, you can incorporate a lovely BBQ before settling down for the match or, if you prefer, you can invite your friends round and all sit around the TV in unison, drink in hand! Whilst the adults enjoy the day with a cold one, why not set up the kids for a penalty shootout competition in the garden? All you need is a 5-a-side goal, a ball and a goalkeeper! If you don’t have a goal, you can’t go wrong with the traditional jumpers for goalposts routine. To get the children involved in the hosting side of your Euros party, why not have them help decorate? They can do team inspired pizzas for half time — St. George pepperoni pizza anyone? They can also help by making bowls of popcorn and crisps whilst singing along to “Football’s Coming Home” all afternoon in the build-up. Once the game kicks off and the passion kicks in, you can feel transported by the atmosphere, as if you were at the game itself. 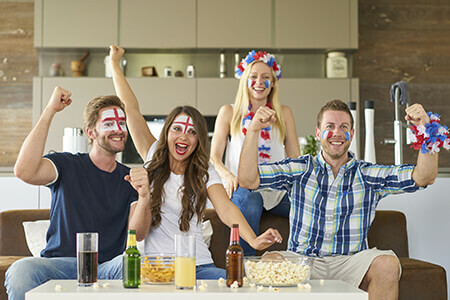 A Seddon Homes lounge is the ideal setting for your Euros party as they are stylish, light and offer enough space for celebrating when your team scores! But when the referee blows for half time, what do you do then? As at most football stadiums throughout the world, there will be a mad rush to get drinks, food and nip to the toilet before the second half kicks off. At a stadium this can feel more like a warzone as you battle against tides of people all trying to do the same as you. In a Seddon home however, this is not the case. We have meticulously planned our homes so that they accommodate modern living. Many of our house types have contemporary downstairs WCs, all have a bathroom upstairs and certain homes even have en suites, making the toilet dash a breeze. Our kitchens are all fitted with modern appliances including fridge/freezers which, for the Euros, will probably be filled with drink and party snacks. The fact that the kitchens are well positioned means that you can achieve all of your half time duties and still get back to the sofa in time to hear the first half analysis. After watching the second half, and praying that England break the habit of a lifetime and don’t go out on penalties, it’s time to unwind and carry on your Euros party. Our gardens are a great place to show off to the family how close you came to turning pro and that you are the next Cristiano Ronaldo with a swift display of ball skills. So as we’re cheering England on this summer in France, we are sure you will fully benefit from the layout of your new Seddon home and you will thoroughly enjoy the championships! If this sounds like the ideal set up for you and you don’t have a Seddon home yet, head down to your local development this weekend and talk to one of our Sales Advisors who can help you begin your customer journey.